Cosmopolitan of Las Vegas (Cosmo) set an official opening date for December of 2010. Kinda. The CEO of the new $3.9 billion Cosmopolitan of Las Vegas casino says it will open in mid-December with about one-third of its rooms delayed until July 2011. 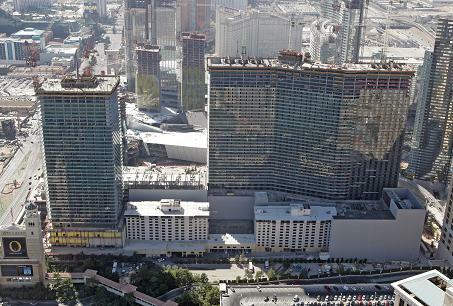 The Cosmo will open in December, but will keep some of its rooms closed. CityCenter properties opened similarly. All of this room capacity that goes unfilled should keep prices in check for a while. So, Cosmo, thank you for opening. You may be familiar with the Cosmo, but not aware that it exists. It’s nestled between CityCenter and Bellagio and surrounding the Jockey Club. You can see the location on the awesome Vegas Today and Tomorrow map. Because of location and look it can easily be confused for part of CityCenter. The Cosmo website has very little information, but everything I’ve read makes it seem as if it will have an urban south beach feel to it with multiple restaurants, clubs, etc. with a fancy beach club in the air between both towers of the hotel. I walked by the Cosmo on the way to CityCenter in December and it looked like it was almost ready to open. I’ll check it out. With it’s proximity to the strip, hopefully it will be inviting to me. I usually do a little video poker research before a trip gambling and this time is no different. Below are the casinos that I may venture into. I won’t play this much video poker, but it’s good to have the knowledge. There aren’t any surprises. Palms has the best pay tables. While the strip doesn’t have anything close. For all the crap people give Harrah’s properties, at least they have $5 9/6 Jacks or Better games. I don’t play much that high, but I do dabble each trip. It’s unfortunate that Venetian and Palazzo pulled their 9/6 Jacks or Better games before my last trip to Vegas in December. As always this information comes from vpFREE, which is a phenomenal resource for video poker information. $5 1 Play / outside high limit room. $8 CI = 1 pt. (2) 25¢, $1 1 Play SP Slant near intersection of corridors to elevators and buffet. The Masters begins tomorrow morning. I won’t be touching this with a 10 foot poll. As of now Tiger Woods is just 3 1/2 – 1. Those are not odds I like. I prefer larger odds. I haven’t thought about golf all year so I have no idea who I’d choose. Odds from Sportsbook.com are below. Seven Stars Insider is back with more information for Harrah’s, Total Rewards, players. Of the subjects covered in this edition, I’m most curious about texpress at Ceasars Palace. I’m into technology stuff like that. On to the newsletter. NOTE: While this newsletter was originally designed exclusively for Seven Stars Club members, there is useful information for anyone who has a Total Rewards® player’s card and/or plays/stays at a Harrah’s property. Please feel free to pass this on to your friends. Back issues of the Seven Stars Insider newsletter are available online at http://sites.google.com/site/sevenstarsinsider/. You will need Adobe Acrobat to view them, but this is a free program available at www.adobe.com. Choose the weekend of April 22 – 25 or April 29 – May 2 and journey to Harrah’s New Orleans. The weekend includes cocktail parties, dinners, local tours and the annual Jazz Fest. Click here for a copy of the invitation. If you haven’t received information, contact your host. Harrah’s Resort in Atlantic City now has a dedicated Seven Stars self-parking area. You’ll need to use a valid player’s card to access the gated area; however, several visits found the gate open so anyone could park there. When leaving the garage, there is a special Seven Stars Club/Diamond express lane which allows you to bypass the booth attendant by swiping your player’s card to open the gate. Caesars, Showboat and Bally’s all have similar express lanes, and Caesars has a gated Seven Stars Club parking area on the seventh floor of its self-park garage. The Atlantis Casino Resort and Spa in Reno is offering $500 in FreePlay, three nights in a luxurious suite and a $100 dining credit to all current Seven Stars Club members, as well as those who were Seven Stars Club members last year (April 1, 2009, to March 31, 2010). For details, go to www.atlantiscasino.com/insider. Texpress – At check-in opt in for Texpress at Caesars Palace and you can do everything from find your Total Rewards balance, check any special offers you might have, get hours of operation and menus for Caesars 12+ restaurants, and more. Simply go to any one of the 14 Total Connect 42” digital screens located throughout the casino. Tap your special room key on the sign and your personalized messages will appear. If you have a special restaurant offer, take your key to that location, give it to an associate and your offer will be activated – no vouchers or promotional codes needed. While at this point Texpress is just a test program, you will have access to this at least through the end of June. Yes, There’s An Ap For That! – Dubbed a “virtual concierge,” a new iPhone ap is being called the “ultimate electronic pocket guide” offering things to do, as well as famous features and tidbits on Caesars Palace’s history. You can take a virtual tour of hotel rooms, review dining options and menus, and view a map of the casino floor. The Special Offers function will alert you to offers just for you, and you can send an e-postcard where your picture appears on the Caesars Palace marquee. Download the ap through the iTunes App store or call **7777 on your iPhone. The Sands Casino Resort in Bethlehem, Pa., will upgrade new My Sands player’s card members to its blue Preferred card. Simply show your Seven Stars Club (or Trump Signature) player’s card when you sign-up. In addition to the standard benefits – same-day comps, free alcoholic beverages on the casino floor, etc., players earn comps at a higher rate, get free valet parking or special Preferred-Level parking in the self-park garage, priority access at the My Sands Card Center, and access to a small private section of the High Limit area which serves hot and cold hors d’ouevres, cookies and other treats. This area also has a small bar, but drinks are not complimentary; though you can use your comp dollars, and prices are extremely reasonable. Visit www.pasands.com for more information. If you like casino buffets, the Las Vegas Harrah’s properties have a special combo offer that’s hard to resist. For $29.99 during one 24-hour period you can sample the following buffets: Flavors at Harrah’s, Le Village at Paris, Carnival Word at Rio, Paradise Garden at Flamingo, Lago at Caesars Palace, Emperor’s at Imperial Palace and the Spice Market at Planet Hollywood. Luxor has been offering something similar, but just at its own buffet, and Trump Taj Mahal in Atlantic City has an all-day buffet offer, as well. The Taj deal is scheduled to end April 30, but may be extended. What’s Your Recommendation For The Annual Seven Stars Trip? Lots of people reported poor or marginal experiences on their trips. Some loved Caesars Palace, others hated it. The Grand Biloxi had several negative reviews, as did Rincon and Ak-Chin (mainly because of their “isolated” locations – especially Rincon where the individuals felt a bit misled in terms of its distance from San Diego and area attractions). Harrah’s New Orleans got unanimous raves. However, one reader was so impressed with her trip to the Flamingo in Las Vegas, she wrote a four-page trip summary. “Overall, the Flamingo made this feel like my first REAL Seven Stars trip, and is definitely the property I’ll return to!” You can view her full report by clicking here. Are You Exclusively A Harrah’s Player? Some people are so loyal, they won’t even play anywhere other than their favorite Harrah’s casino; others “play around” at a number of Harrah’s casinos, but wouldn’t even consider playing at another chain’s casinos. What about you? Are you also a “regular” at any non-Harrah’s casino? Do you hold another casino’s premium (similar to Diamond level) or ultra-premium (similar to Seven Stars) card? Send me an email (sevenstarsinsider@gmail.com) and I’ll share your thoughts – anonymously, of course – with everyone in a future newsletter. Dita Von Teese is in the midst of a short run as a guest at MGM Grand’s “Crazy Horse Paris.” In fact, I missed the beginning of the run and she’s done April 7. As a burlesque artist Dita Von Teese is known for her raunchy performances…The Crazy Horse is an iconic Paris burlesque show, which Dita says inspired her current career. I find Dita Von Teese interesting as she always seems to have a different, retro look. Get tickets on the MGM Grand website if you’re in town. If not, you’ll have to enjoy a nice PG picture. The People Have Spoken…The Palazzo Wins! The people have spoken. I asked where I should stay on my next trip to Las Vegas – Palazzo or Planet Hollywood. My twitter poll came back 2-1 in favor of Palazzo and my question on Trip Advisor came back even more in favor of Palazzo. So, I’ll keep my Palazzo reservation. I may also keep one night at Planet Hollywood. I’m sure I’ll be there not sober at some point so the extra room may be worth it. I didn’t get a chance to gamble at Planet Hollywood on my trip to Las Vegas in December. That will change. Thanks to everyone that voted and helped me solidify my choice of the Palazzo.